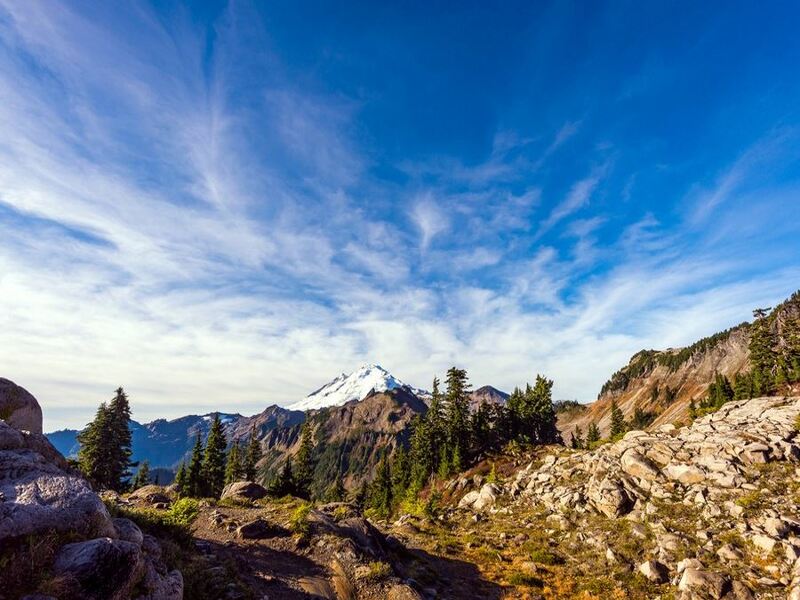 Washington state is home to some of the premier hiking regions in the United States. The local evergreen trees grow is such abundance that Washington has earned the moniker, “The Evergreen State.” An incredible 52% of the state is forestland, which includes three National Parks and nine National Forests. The best thing about Washington is that you can find any environment your heart desires. The east side of the state is a dry desert climate with rich agricultural soil, the western edge of Central Washington has the renowned Cascade Mountain Range that locals identify as the dividing line between Eastern and Western Washington, and the west side of the state has a rain forest with an extensive island chain that leads to British Columbia and the Pacific Ocean. Washington is the jewel of the Pacific Northwest, and these are the best hiking regions in The Evergreen State. The Colville National Forest has the best hiking east of the mountains. Colville is in Northeastern Washington near the Idaho and Canadian borders. This region was formed roughly 10,000 years ago when glaciers carved into the earth and created the valleys of the Columbia Basin. 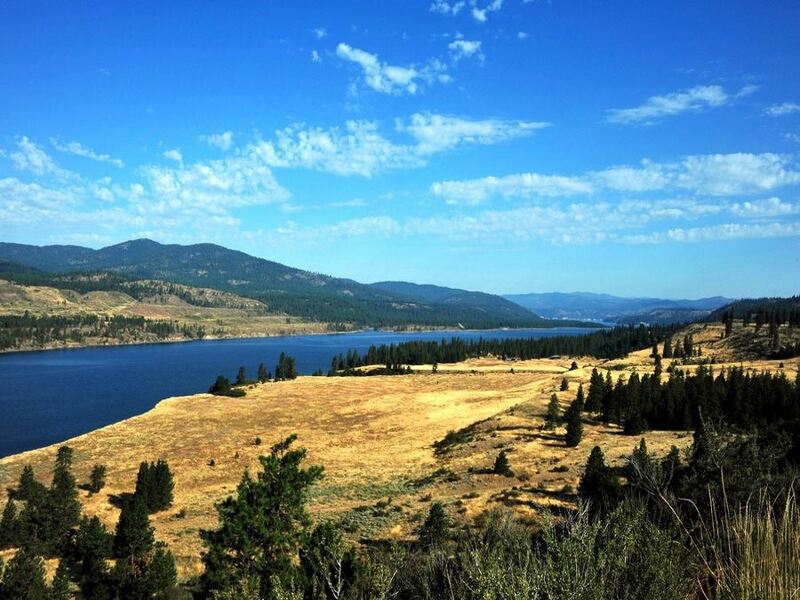 The Columbia River separates the Colville National Forest into two separate sections: the east section near the town of Colville, and the western section that is connected to the north end of the massive Colville Reservation.  Although the Colville Reservation is connected to the National Forest, the two areas are run by a different agency and may require different permits. The best hikes in the region are the Hall Mountain Trail on the east side of the forest, and the Sherman Peak Loop Trail in the west. The Mount Baker-Snoqualmie National Forest colloquially referred to as Mt. Baker, or Snoqualmie, covers more than 140mi between the Canadian border and Mount Rainier National Park. The forest has over 1,500mi of hiking trails and contains over 800 lakes, most of which lay high in the Cascade Mountain Range. Snoqualmie is only an hour outside of Seattle and is a popular destination for Seattleites looking for an adventure. This forest is a winter wonderland that contains more glaciers and snowfields than any other national forest in the country. 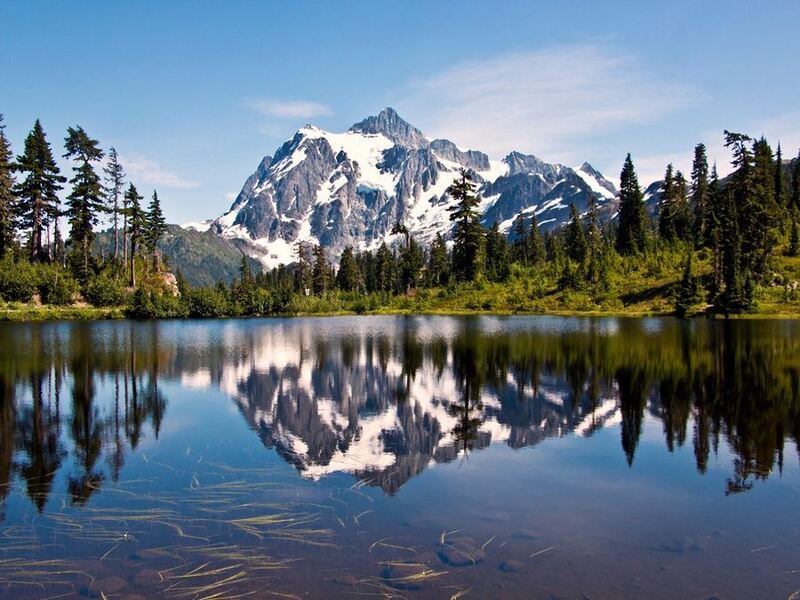 Mount Baker-Snoqualmie National Forest is perfect hiking, climbing, mountaineering, snowshoeing, and anything else your adventerous heart desires. The Wenatchee National Forest is located on the eastern slope of the Cascade Mountain Range. The forest encompasses over 2.2 million acres of beautiful Pacific Northwest terrain. The Wenatchee National Forest connects with the popular Lake Chelan in the North and the Yakima Reservation to the south. The Cascades are an important transition zone in the state of Washington and divides the wet western half of the state and the dry arid eastern half. The west side of the Cascades receives roughly 70 inches of rain on average, while the eastern side receives only ten inches. This plays a huge role in the ecosystem of the Wenatchee National Forest as you will start to see more spruce, pine, fir, and larch tree species. 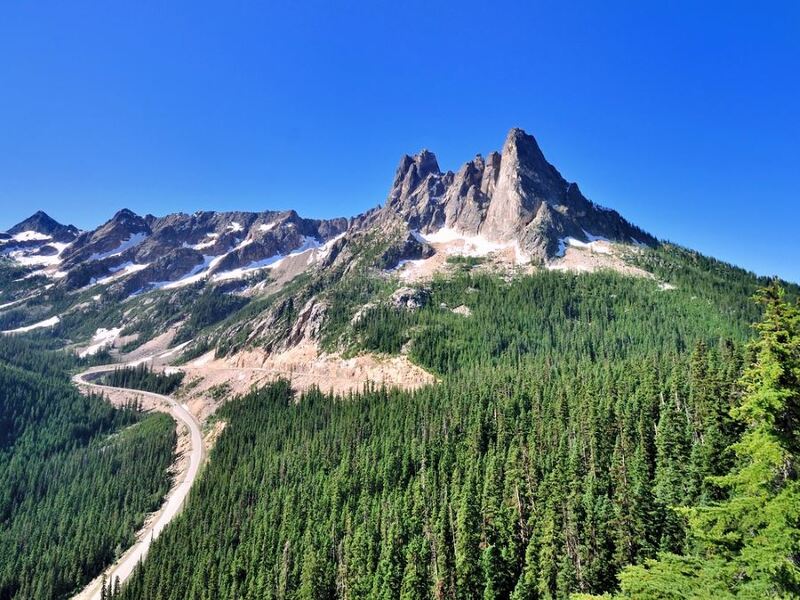 The Wenatchee National Forest is a fantastic – and dry – place to hike for Western Washingtonians looking to escape the rain for a weekend. 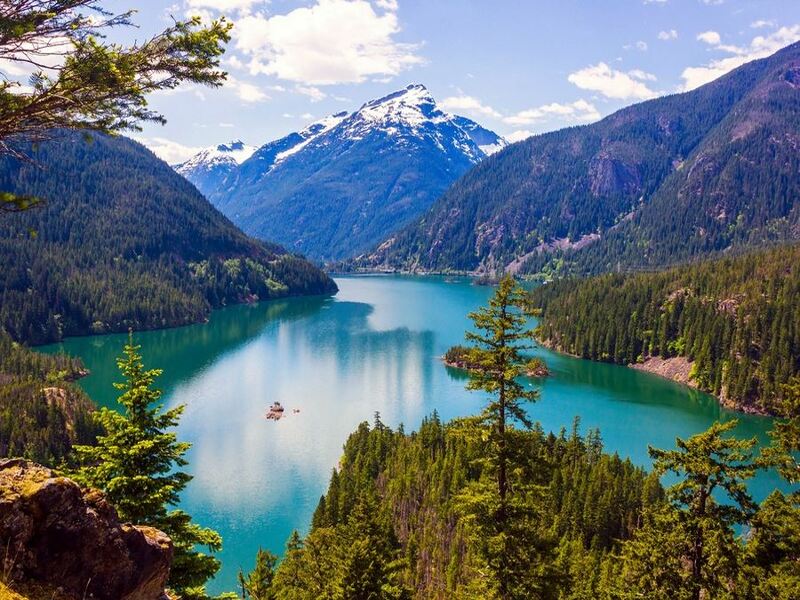 The North Cascades are located at the northernmost point of Central Washington and leads into E.C. Manning Provincial Park in British Columbia. This beautiful region is an outdoorsman’s playground with nearly 400mi of hiking trails, over 300 glaciers, and more than 127 alpine lakes in the two-million-acre park. 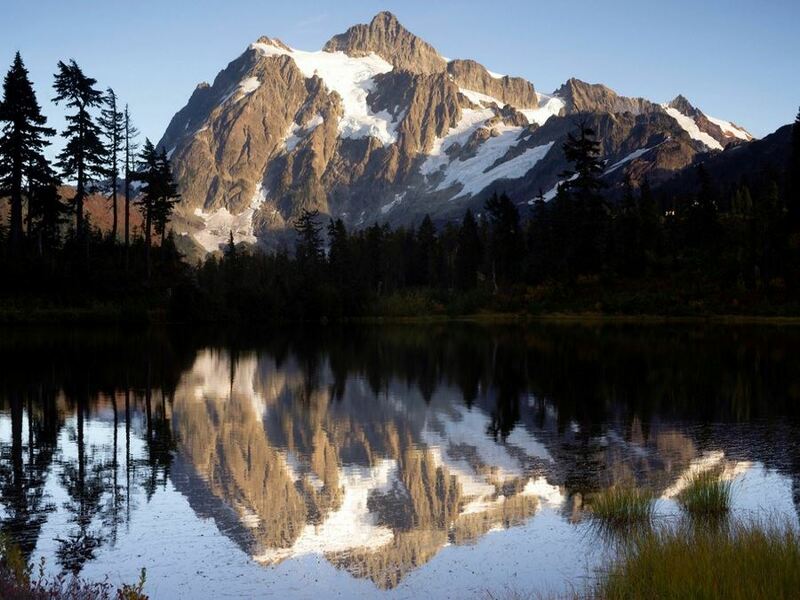 The North Cascades National Park is best known for being the first, or final leg of the 2,650-mile Pacific Crest Trail. The park is open year-round, but Washington is an incredibly wet state so the park has most of its visitors between the dry months of April and September. During the winter months, the park experiences heavy snowfall that can render trails inaccessible. 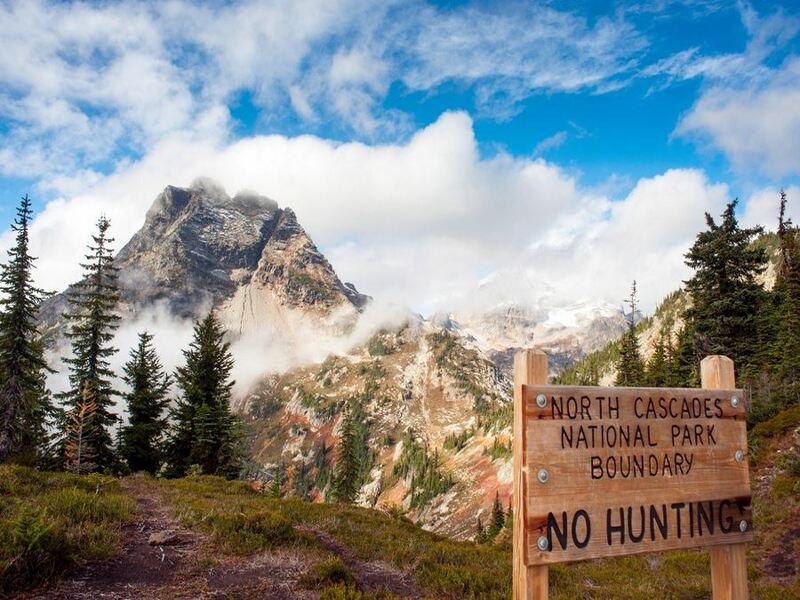 Always double-check trail conditions before heading to the North Cascades! 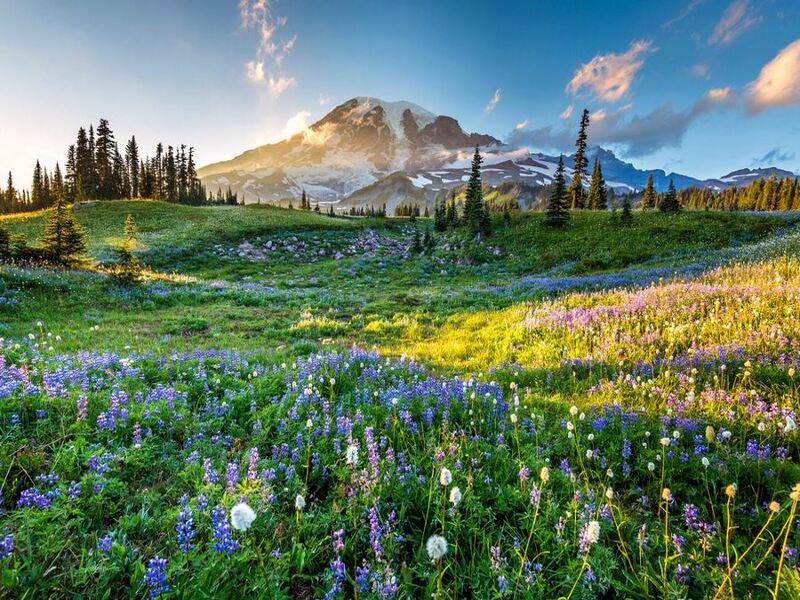 Mount Rainier National Park was established in 1899 making it the fourth oldest National Park in the United States. 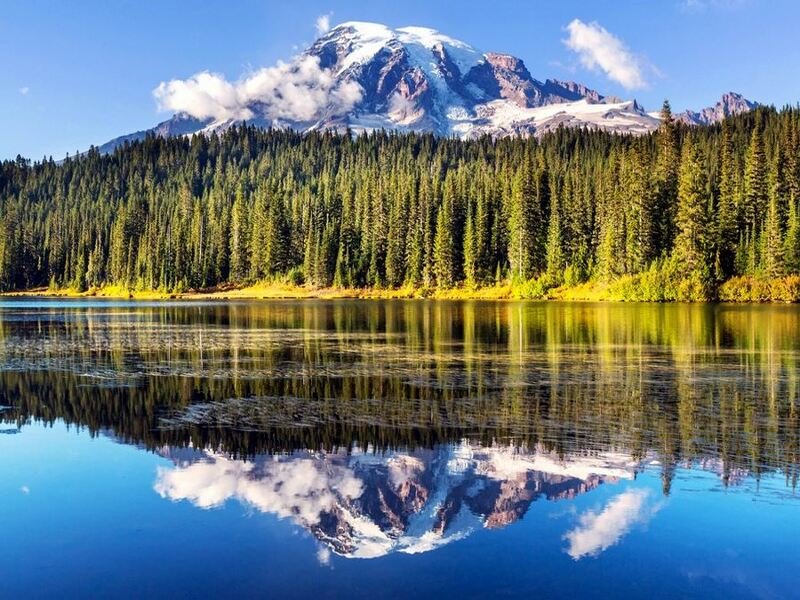 The 14,410 ft Mount Rainier is the namesake for the park and the most iconic natural feature in Washington state. The majestic mountain is so popular that the state uses its image on license plates for Washington state drivers. 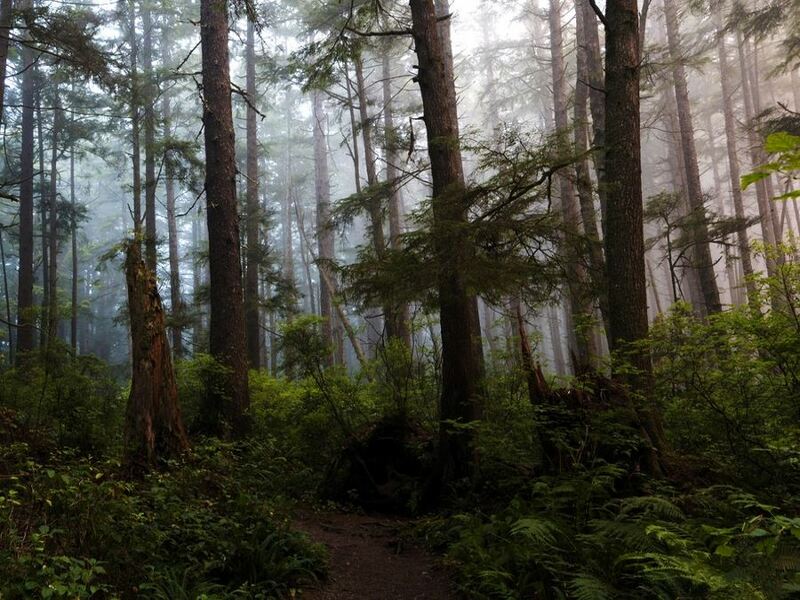 The park covers roughly 369 sq mi of old growth forests and offers over 260mi of well-maintained hiking trails. The best-known hike in Mount Rainier National Park is the Wonderland Trail that circles Mount Rainier in a 96.2mi loop. During this hike, you will gain over 27,000 ft of elevation in 5-7 days. This hike is strenuous and requires a lot of planning, but it’s one of the most breathtaking thru hikes in the state. 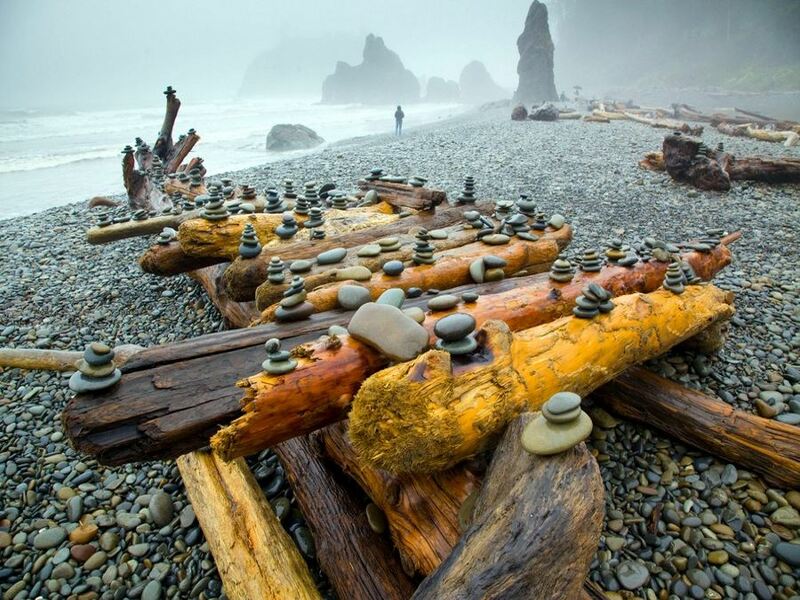 The Olympic National Park rests along a 70mi stretch of the Olympic Peninsula in Northwest Washington and contains over one million acres of beautiful temperate rainforests and the snow-capped Olympic mountain range. South of the park is the Olympic National Forest that has over 250mi of hiking trails. The National Forest can be enjoyed year-round as most of the hiking trail are of a low elevation and don’t receive large amounts of snow; however, this is a rainforest, so if you come to the park between October and April you must come prepared for rain. To the east of the Olympic Peninsula is the Puget Sound and to the west is 56 islands that you can hop around until you hit British Columbia. Washington state is home to the largest ferry system in the world, and one of the many benefits to having a massive ferry system is that you can easily island hop, and – better yet – it’s free to ride the ferry between islands! 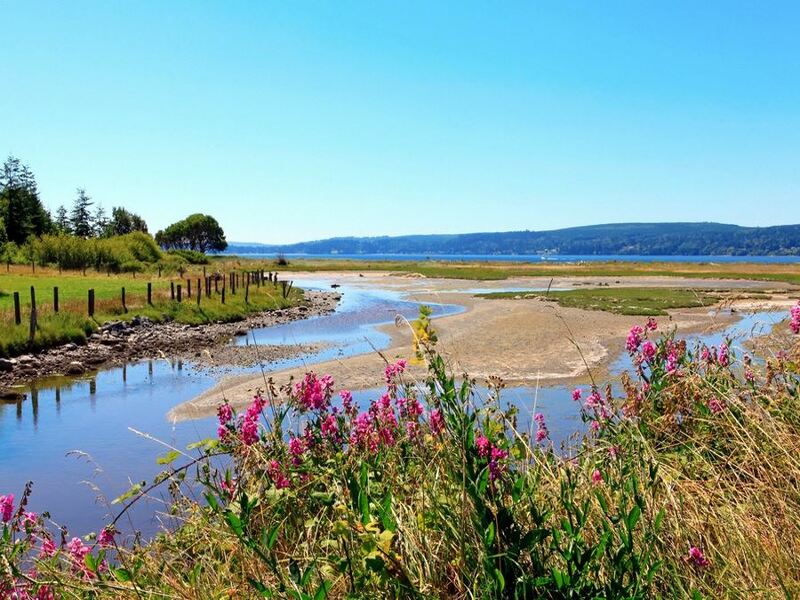 The Olympic Peninsula has some of the most beautiful terrains in Washington with the Pacific Ocean to the west, Puget Sound to the east, 2,100m Mount Olympus, and hundreds of miles of gorgeous temperate rainforests. It’s everything an adventurer could want in an expedition!